Step-by-step home baking recipes from France's foremost culinary resource, Larousse, and Parisian master baker Eric Kayser. The Larousse Book of Bread features more than 80 home baking recipes for breads and pastries from two of France's most trusted authorities. From traditional Boule and Cob and specialty Ryes and Multigrains, to gluten-free Organic Sour Doughs and Spelts and sweet Brioches, Kayser's easy-to-follow recipes feature detailed instructions and step-by-step photography. 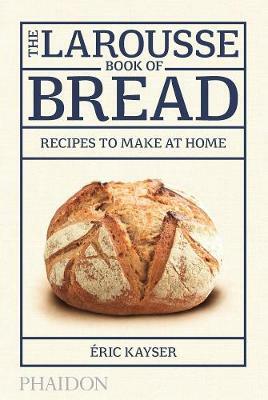 No matter if you are creating quick and simple Farmhouse Breads or gourmet treats like Croissants and Viennese Chocolate Bread, with it's unique structure and a comprehensive guide to techniques, ingredients and equipment, The Larousse Book of Bread is the ideal baking resource for both home cooks and professionals.